sample of producers of wire mill products. The figures ITA9008(87)-1, issued June 1987. IRepresents copper content weight, rather than metal weight. 2Represents uninsulated, bare, tinned, and/or alloy coated wire. 3Source: Bureau of the Census, Current Industrial Report Series, M33E, Nonferrous Castings. Address inquiries concerning these figures to U.S. Department of Commerce, International Trade Administration, Materials Division, Washington D.C.
20230, or to the Bureau of the Census, Industry Division, Washington, D.C. 20233, or call Carol Beasley, (301) 763-5434. For sale by Superintendent of Documents, U.S. Government Printing Office, Washington, D.C. 20402. (Z) Less than 500 thousand pounds. 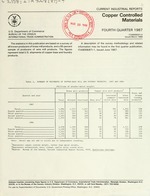 table 4 in the first quarter 1987 report, ITA9008(87)-1, issued June 1987. 3Source: Bureau of the Census report IM 146, U.S. Imports for Consumption. 5This total does not include either insulated wire and cable or brass and bronze foundry products.